Vibrant Home is pleased to add The Original Laces Company of Maldon, England to its ever growing list of suppliers. 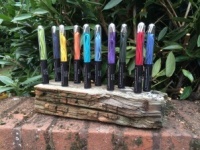 Ian Bates the founder started designing and manufacturing coloured shoelaces in February 2014 with metal, embossed and laser etched tips called aglets. The Orginal Laces Company was started due to Ian's frustration at not being able to find quality shoelaces produced locally, which would not break easily. We at Vibrant Home love the colour and quality of these laces and hope you do as well especially as they are British made.